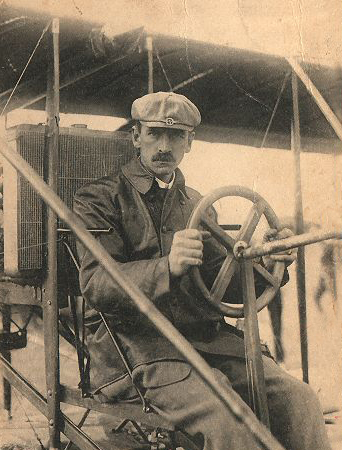 As we mind the gap, we might send lofty birthday greetings to Glenn Hammond Curtiss; he was born on this date in 1878. While it’s generally accepted that the Wright Brothers made the first powered flight, Curtiss took the plane from its wood, fabric, and wire beginnings to the earliest versions of the modern transport aircraft we know today. Curtiss made his first flight on his 30th birthday (this date in 1908), in White Wing, a design of the Aerial Experiment Association, a group led by Alexander Graham Bell. White Wing was the first plane in America to be controlled by ailerons (instead of the wing-warping used by the Wrights) and the first plane on wheels in the U.S. Curtiss went on to found the Curtiss Aeroplane and Motor Company (now part of Curtiss-Wright Corporation), and to make dozens of contributions to the technology of flight. Perhaps most notably his experiments with seaplanes during the years leading up to World War I led to major advances in naval aviation; indeed, Curtiss civil and military aircraft were predominant in the inter-war and World War II eras.